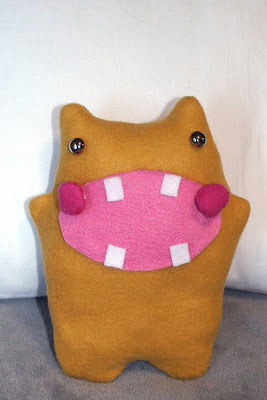 This is without a doubt a project you will find no where else on the interwebs - how to make a monster doll with removeable tonsils. 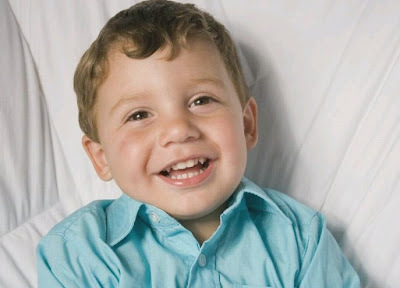 The project came about because this little guy, my great-nephew, was having his tonsils out. He also wanted a monster doll. The store-bought variety cost $20 to $40. And none featured removeable body parts. 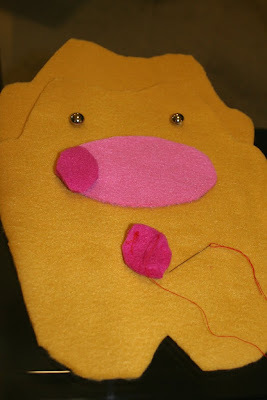 I sewed two fleece "tonsils" (we had to consult Google images to even know what a tonsil looks like, and I do think these are a pretty good likeness) and attached them with velcro. 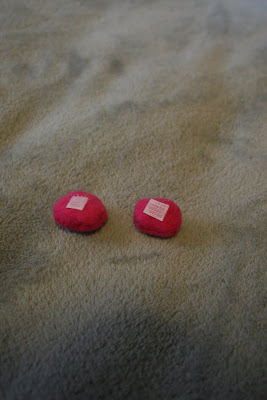 To make the doll, I followed the basic steps outlined here. 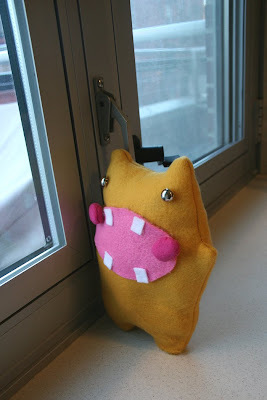 This doll is made from a piece of yellow fleece from another project. 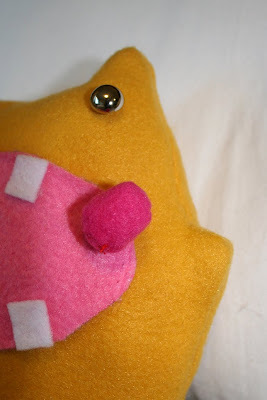 The mouth and tonsils are also fleece, and the teeth were made from scrap pieces of felt. I favor buttons for eyes since they offer the beady blank look I'm going for. One improvement from my last go at monster making is to sew a straight seam (by hand or with a sewing machine) and turn the monster inside out. Sewing the seam from the outside ended up not looking so good with fleece. Here is the doll waiting to be mailed somewhere warmer than Brooklyn, New York. "he loves his monster doll. he named him snatters. *don't ask me* we r on a neverending hunt for at least one of the tonsils. =) "
that is the sweetest gift. removable tonsils?? hilarious.